Gregg Kaplan's partner has vanished without a trace. Following a tip that led him across the country to a small town in Wyoming, he finds himself in trouble once again when two of the town's bullies assault a young Native American woman. This time it lands him behind bars. Kaplan quickly learns that the men he just put in the hospital are the sons of a wealthy and politically connected land baron. Town Marshal Christine Cavalier is stumped by recent crimes in her once peaceful town. After one of her deputies is murdered, she realizes her understaffed department cannot handle the wrath of the most powerful man in town. She is forced to turn to a man with special skills---Kaplan--who is pushed into an unwanted alliance with the marshal in exchange for what he believes the marshal knows about Isabella. Aided by his friend, Pete Moss, and the Town Marshal, Kaplan finds himself in a deadly shoot-out. Cavalier believes the killer is dead, but Kaplan knows somebody more sinister is the mastermind behind the killing spree, but is it too late to stop him before he kills again? 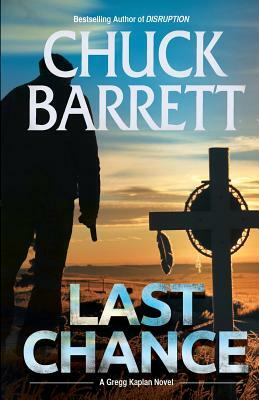 With relentless pacing, striking twists, and some of most devious characters yet, LAST CHANCE is Chuck Barrett writing at his awe-inspiring best.